4 months old and never been kissed. CAN YOU HANDLE IT??? She's too cute to be legal. At 4 months old she is finally (kind of) fitting into size 1 diapers and 0-3 month clothes. She is a very good, happy, easy-going baby. PTL! Combine her cuteness with the Park City fall weather (also known as heaven) and we've got ourselves the happiest cocktail of any happy hour ever. 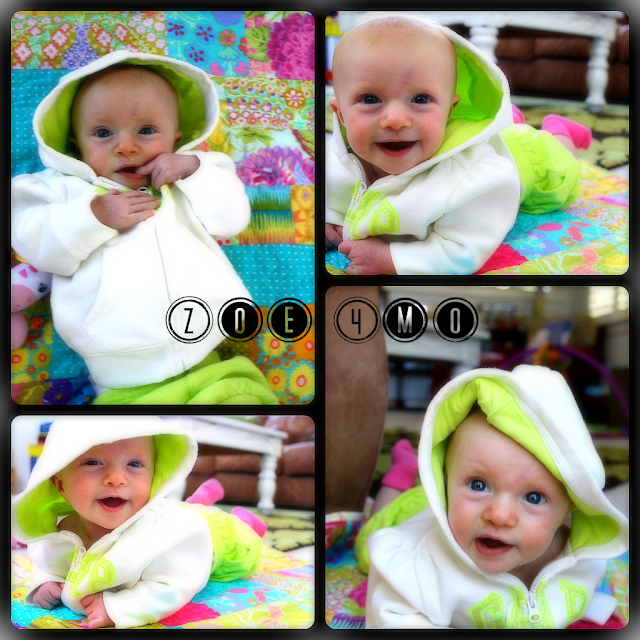 Miss Zoë I love the bright lime green and pink... such wonderful color in these photos!!! You get cuter every day... no wonder Mommy kisses you so much. I'm really starting to see Peter in this little Zoe face... Definitely too cute for words!!! She is so darling! Looks like both her older brother and sister and her Mommy. Genes are amazing! I like the lower left photo best. So happy! She looks alot like Lucy there. I can't believe how big she is getting! And still so small!